Chihuahuas are comical, entertaining, expressive, and loyal little dogs. They burrow under blankets, dance on their hind legs, wave their paws in the air, and lick everything in sight. Chihuahuas are absolutely brimming with personality – often a quirky and eccentric personality unmatched by any other breed. Other than that generalization, Chihuahuas are extremely variable. You can find individuals who are lively or placid. Bold or timid. Feisty or mellow. Confident or nervous. Stubborn or eager to please. How a Chihuahua turns out depends very much on the genetic temperament of his parents and grandparents. In other words, entire lines of Chihuahuas are social or antisocial. If you bring home an individual who has inherited genes for a bad temperament.... well, let's just say that's not a wise thing to do unless you're prepared to live with an unstable dog. Socialization and training often can't overcome bad genes in a Chihuahua. But socialization and training ARE still extremely important! As long as your Chihuahua has inherited genes for a normal temperament, how you raise him will determine how he turns out. 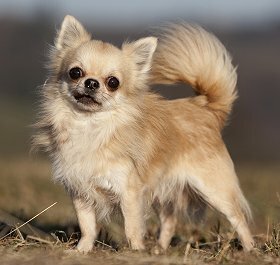 Chihuahuas do not have a particularly good reputation among the general public. Ask a few people, "Do you think Chihuahuas are nice dogs?" and see how many of them exclaim, "No! They're mean and nasty and they bite!" Sadly, this reputation has some basis in truth. 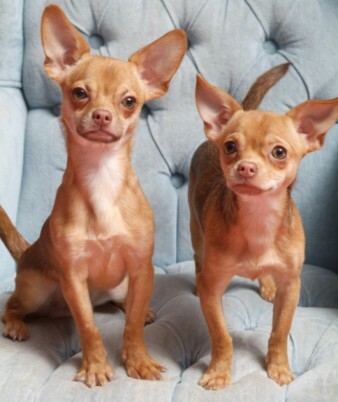 So many people stupidly breed two Chihuahuas whose temperaments are not good. Then their puppies inherit genes for a bad temperament. Duh. Other people take a perfectly good Chihuahua and treat him like a stuffed toy or doll, or as a substitute for a human infant. They carry him everywhere in their arms, which essentially tells the dog that the world is unsafe for him to walk through. Or they don't teach any commands, laugh at signs of aggression, make excuses for bad behavior, and soothe and coo over the dog constantly. It's no wonder that so many Chihuahuas are neurotic when they're made that way by their owners. Spoiling is a dreadful way to raise a dog; all it does is make the owner feel good, while creating an insecure dog who barks manically whenever he sees something that looks or sounds unfamiliar. What an awful state of mind for that dog to live with. 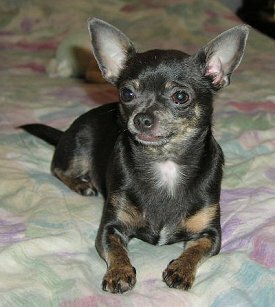 Long Coat Chihuahuas – a black and a chocolate. On a chocolate Chihuahua, even the nose is chocolate brown. All dogs, whatever their size, should be taught how to walk on their own four feet, how to do what they're told, and how to get along peacefully with the world. This creates a confident, stable Chihuahua. Now, you do need to take precautions! There are indeed dangers lurking everywhere for toy dogs. The trick is to let your Chihuahua walk on his own as much as possible, while still keeping an eagle eye out for real danger. Chihuahuas adore warmth, oh, yes! They will seek out the tiniest sunspot in which to bask blissfully. They also burrow under blankets and tunnel under towels. You need to be careful whenever you sit down on your sofa or bed, as there could be a Chihuahua tucked under there. Why do Chihuahuas shiver or tremble so much? Well, they might be a little cold, but usually they quiver when they're either nervous or excited. The most difficult thing to teach a Chihuahua? Housebreaking. 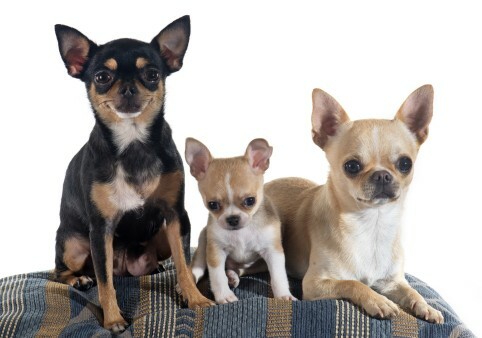 Chihuahuas are VERY difficult to housebreak – one of the most difficult of all breeds – especially in cold or wet weather. In cold or rainy climates, consider an indoor litter box, or a doggy door that leads out to a covered potty area. 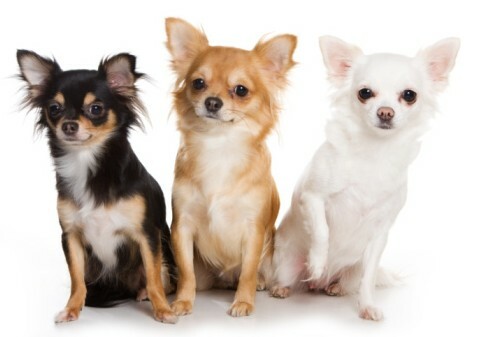 Some Long Coat Chihuahuas have a bushy coat, while with others (such as these three lovelies), you can only tell they're longhaired by the tufts of hair near their ears. According to the official breed clubs, Chihuahuas should be about 5-9 inches at the shoulder and weigh 2-6 lbs. But some individuals are smaller, and many individuals are larger – often twice as large. You might have heard of a Teacup Chihuahua? a Tiny Toy Chihuahua? an Extreme Tiny Chihuahua? Those phrases are made-up. There is no such breed or variety as a Teacup Chihuahua, or any of the other names. They're simply marketing phrases used by clever breeders who want you to think you're getting some kind of extra-special Chihuahua.... one for which you will pay through the nose. Such a breeder might tell you that "Toy" Chihuahuas are a certain weight range, "Tiny Toy" Chihuahuas are slightly smaller, "Extreme Tiny" Chihuahuas are smaller than that, etc. These breeders might even price their dogs according to weight, as if that should define a dog's value. And their prices are typically ridiculous. There are NO weight divisions in this breed. It is perfectly natural for one individual to weigh more or less than another. Whether an individual weighs 2 lbs or 6 lbs or 12 lbs, he's still a Chihuahua, which is a Toy breed. All Chihuahuas are Toys. 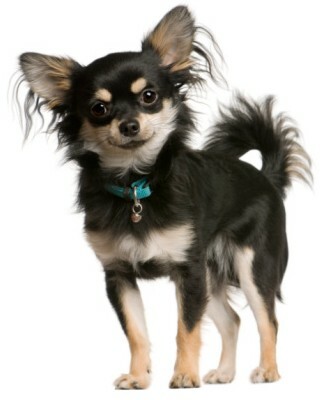 Unfortunately, Chihuahuas under 2 or 3 lbs are at greater risk when it comes to health. Their bones are more fragile. There isn't enough room in their mouth for healthy teeth. They can have difficulty regulating their blood sugar and can go into hypoglycemic shock if they go too long without eating. Their internal organs are often weak and can fail suddenly – you might come downstairs one morning and find them inexplicably dead in their basket. Thus, responsible Chihuahua breeders never try to produce these high-risk creatures. If an especially tiny Chihuahua pops up in one of their normal-size litters, they find the best home they can for it. But they try not to produce them in the first place. So if possible, try to stick with Chihuahuas who will mature at 4 lbs and up. They have the best chance of living a normal healthy life. How can you tell whether a Chihuahua puppy will mature at 4 lbs and up? There's a general rule of thumb that says you can take the weight of a Chihuahua puppy at 14 weeks old and double it to estimate his adult weight. So to get an adult who will weigh 4 lbs and up, look for a 14-week-old pup who weighs at least 2 lbs. It's not perfect, but it's usually pretty close. Also look at the parents. If both parents are less than 6 lbs, their pups are more likely to be, too. If one or both is oversized, their pups are more likely to be, too. Would you feel silly bringing a postal scale along when you visit a litter of Chihuahua pups? I wouldn't. An awful lot of breeders will lowball their pups' weights in order to make a sale. 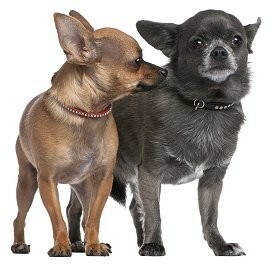 Don't be too quick to pass up Chihuahuas who are at the top end of of normal, or even oversized individuals. They're still Chihuahuas, they're still plenty small, and they make sturdier pets. 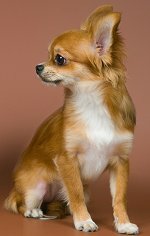 Are there different "types" of Chihuahuas? We've already talked about different sizes. 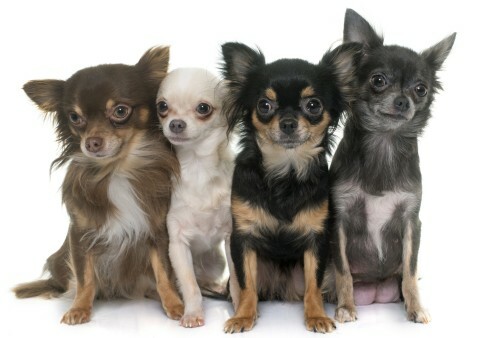 Chihuahuas also come in different coats (short and long), different head types (applehead and deerhead), and different body types (cobby build and deer build). 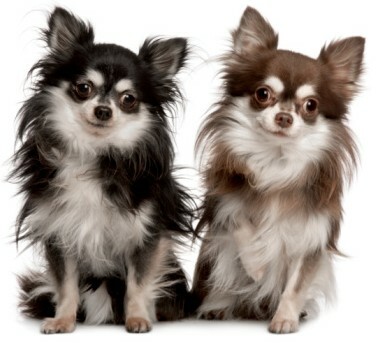 Officially, Chihuahuas come in two varieties: Smooth Coat (shorthaired) and Long Coat (longhaired). A smooth coat can be a double coat, which means an outer coat, plus an insulating undercoat that makes the outer coat stand out from the body a little bit. Double-coated dogs stay warmer in the cold, but also shed more. Or a smooth coat can be a single coat, with no undercoat. Though this coat feels the cold more, it sheds less than a double coat. Finally, a smooth coat can be a single coat that is so short and sleek it's difficult to ripple the hairs backward. It looks and feels somewhat like a Doberman Pinscher's coat. This is not really a "correct" Chihuahua coat, but it does occur. A long coat can be a double coat (outer coat, plus undercoat). Or a long coat can be a double coat with such long hair or with so much undercoat that the coat puffs out from the body like that of a Pomeranian. This type of coat is more time-consuming to bathe and brush and sheds the most of all. Finally, a long coat can be a single coat, with no undercoat. A single coat lies flatter against the body than a double coat because there's no undercoat pushing it away from the body. In fact, some long coated Chihuahuas hardly look longhaired at all and are mainly identified by the tufts of hair around the base of their ears and some feathering on their legs, stomach, and tail. A single coat feels the cold more, but is easier to groom and sheds less than a double coat. Do Smooth Coats and Long Coats have different temperaments? Maybe. I find many (NOT ALL!) Long Coats to be milder-mannered and more willing to please. Most Chihuahuas I've seen competing in agility and obedience have been Long Coats. But I do love my quirky Smooth Coat rescue! Chihuahua clubs will tell you there is only one proper head type: a large rounded skull known as an apple head. The curvature begins at the back of the skull, arcs over the skull between the ears, and drops vertically down between the eyes to join the muzzle at about a 90-degree angle. Usually that muzzle is shortish, and rather broad and blunted. However, shortish can be carried to extremes. Some Chihuahua show lines have such short, blunt muzzles that they make snorting sounds. Not good. Although the Chihuahua clubs wish it weren't so.... there is another head type called a deer head (yes, like a deer). This Chihuahua head is flatter on top, rather than domed. Instead of having an abrupt vertical drop between the eyes, there is a gradual slope from the top of the head down between the eyes and continuing along a longer, pointier, foxier muzzle. This head is not correct for showing in the conformation ring. But it's fine for any other activity (obedience, agility, etc.).... and that slope is just right for kissing. Deer again? Yes, it's a bit confusing, but deer can describe a head shape (see above) or a body shape. Some Chihuahuas are rather chunky and short-legged. This is known as a cobby build and you'll see a lot of them in show lines. It's fine in moderation, but if taken to extremes, it can result in squat Chihuahuas with curved legs and joint problems. This cute Chihuahua, all bundled for cold weather, has both a deer head and a deer build. 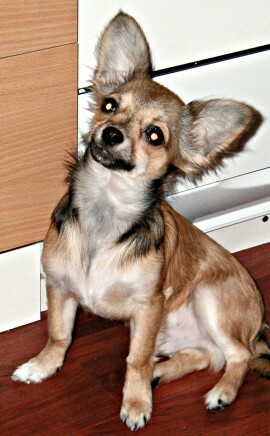 Other Chihuahuas are more slender and longer-legged. This is known as a deer build and these dogs are often athletic and agile. But if taken to extremes, it can resemble a teeny tiny greyhound with long spindly legs. So in Chihuahuas, deer can refer to a slim, leggy build, or a flat-skulled, long-nosed head. Some Chihuahuas have both a deer-like build and a deer-like head. Others have one deer-like feature, but not the other. How much exercise do Chihuahuas need? Technically, Chihuahuas need very little outdoor exercise, so they're perfect dogs for owners who don't have a fenced yard. 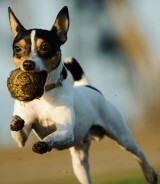 But truthfully.... Chihuahuas love to have a safe place to run and play on the grass, just like larger dogs do. And they adore half-mile walks around the block. Keep your Chihuahua on-leash! Even if you felt that your particular dog would stay with you, there are far too many dangers lurking for a dog of this size. Are Chihuahuas easy to train? Most Chihuahuas need very little obedience training. They need to learn only a few basic words, like No, Yes, Come, Wait, and Okay. Some individuals are easy to train, while others are a bit more stubborn. No is particularly important because you need to be able to stop your Chihuahua from barking and from acting suspiciously or aggressively toward strangers and other dogs. 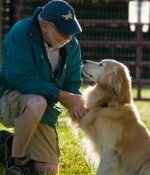 As important as those few words and commands are, housebreaking is even more important. Chihuahuas need to learn where to go to the bathroom, and where not to go – and this can be biggest training challenge in this breed. As a behavioral consultant, the Chihuahua is firmly on my Top 5 list of hardest breeds to housebreak. If you live in a cold or rainy climate, housebreaking will be especially difficult, because Chihuahuas hate both the cold and the rain. In these climates, a COVERED potty area is strongly recommended. Sometimes a doggy door is necessary so your Chihuahua can run outside the moment he feels the urge in his tiny bladder. An indoor litterbox is another option. All of these housebreaking options are detailed in my puppy training book, Respect Training For Puppies. Most Chihuahuas are naturally reserved with strangers. In fact, many Chihuahuas will put on a display of excited ferociousness ("they pitch a fit") when other people approach what the Chihuahua considers to be "his." It sounds funny, but it's not. If you don't stop this behavior dead in its tracks, your Chihuahua may end up disliking everyone in the world, which is a short step to biting when someone unwittingly instrude on "his" space. Raising a Chihuahua properly means making it clear to him that yes, he can be aloof or suspicious – but without letting everyone within earshot know about it, and without progressing to threats. It's up to YOU to draw and enforce the line. Fortunately, there also exist Chihuahuas who are standoffish, but who will eventually approach people in their own good time, especially if the person isn't pushy or insistent. And some Chihuahuas are very friendly right from the get-go and will go to anyone. I never recommend keeping a Chihuahua with children under the age of about 10, no matter how well-meaning the child. Younger children cannot help being clumsy, and that a child "meant well" is little solace to a Chihuahua who has been accidentally stepped on, sat on, squeezed, hit with an errant ball, or dropped down the stairs or onto the concrete patio. In addition, most Chihuahuas feel overwhelmed by the loud voices and quick movements that children can't help making, and stress and fearfulness (even defensive biting) may be the result. Are Chihuahuas good with other pets? 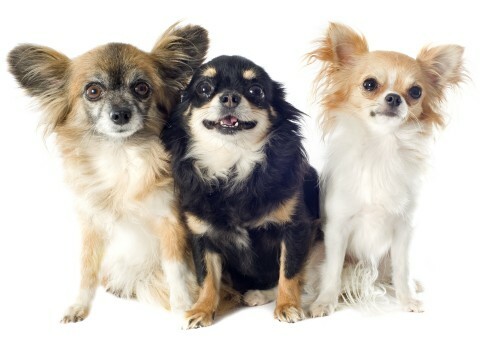 Most Chihuahuas get along great with other pets in their own family. But you should be careful about mixing them with larger dogs. If you want to try this, be sure you can read dogs accurately, and be sure the other dog is quiet, gentle, and well behaved. A big bouncy dog can hurt a Chihuahua by accident. I would not mix a Chihuahua with a breed whose heritage is chasing prey animals. Chihuahuas can look like prey animals, especially when they move quickly. This can trigger instinctive chasing behavior in breeds such as medium to large terriers, sighthounds, and northern (spitz) breeds like Alaskan Malamutes and Akitas. 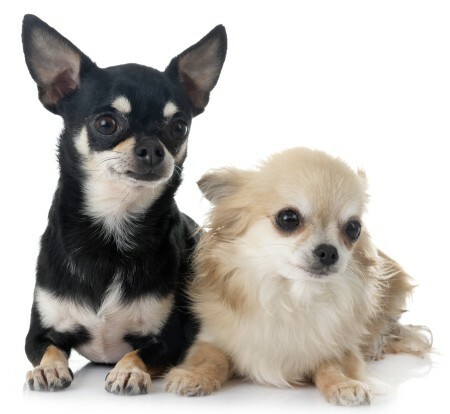 If possible, you should keep a Chihuahua with another small breed, ideally another Chihuahua. This breed is unusual in that it usually recognizes and strongly prefers being with another member of its own breed. Two Chihuahuas will keep each other company when you're gone, will play together, will clean each other's ears (Chihuahuas can be obsessive ear-lickers! ), and will keep each other warm by snuggling together. How do Chihuahuas get along with dogs outside their own family? Often not well. Chihuahuas often raise a ruckus when they spy a strange dog, especially a larger dog. It's as though the Chihuahua wants to convince the larger dog that he is a force to reckon with rather than a helpless prey animal. The Chihuahua may be seeking to protect itself by putting up a blustering facade that tells the other dog to "move along." This is an anxious state of mind for your little dog to live with. 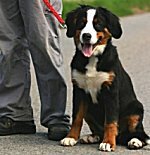 Better to teach him that you are the leader who will take charge of keeping him safe and keeping other dogs away from him. Then he will be able to relax and leave everything up to you. That's the psychologically healthy and secure mind-set you want your dog to have. Summary: don't allow your Chihuahua to bellow threats at other dogs. It's not safe for the Chihuahua, it's not psychologically healthy for the Chihuahua, and it contributes to the breed's reputation as a nasty little yapper. Grooming: do Chihuahuas shed a lot? Are they easy to groom? Chihuahuas are NOT a non-shedding breed. Chihuahuas are NOT on my list of Best Breeds For Allergy Sufferers. If you come to my house, you will leave with dark gray hairs on your clothes. Dark gray hairs that belong to my Chihuahua. Yes. Chihuahuas shed. Now, the actual amount of shedding depends on whether the coat is single or double. NOT on whether the coat is short or long, but whether it is double (outer coat plus undercoat) or single (just an outercoat). Remember we talked about single and double coats earlier. Whether a coat is short or long, the double coats shed more than the single coats. Which makes sense. 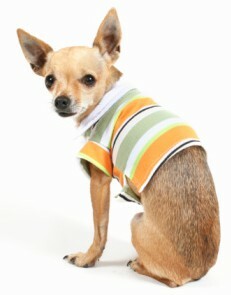 Long Coat Chihuahuas need regular brushing and combing to prevent mats and tangles. The longer and thicker the coat, the more work it will be. Longhaired Chihuahuas also need trimming every few months. Focus on the longish hair around the dog's private parts. Otherwise whenever he goes to the bathroom, the result is going to be unsanitary, both for the dog and for your house. Anything that sticks to long hair eventually ends up on your floor or furnishings. So keep all of your dog's private parts trimmed short. Are Chihuahuas healthy? How long do they live? Are they healthy for those 13-15 years? That depends on you. 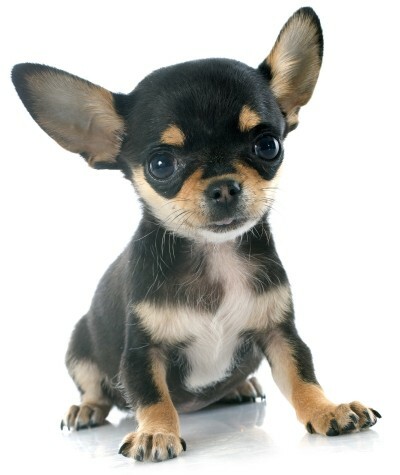 Chihuahuas are more prone to injury than to illness or disease. 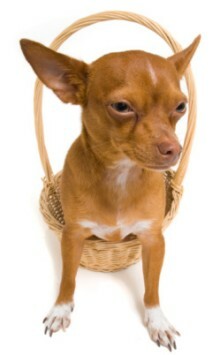 So whether a Chihuahua lives a long healthy life, or not, is more dependent on how careful you are to keep them safe. That's quite a responsibility! Remember, a tiny creature can be seriously injured or killed by something that a bigger dog would barely feel. Leaping from your arms. Some Chihuahuas melt into your arms and stay there, but many are wriggly. They can be deceptive about it, too, apparently settling into your arms with contentment, then suddenly launching themselves through the air if you relax your grip. A fall from a few feet up, especially over a hard surface, can result in a broken leg or concussion. Hold on tight if you pick up a Chihuahua over concrete. Children should not pick up this breed. If an older child is trustworthy and your Chihuahua is calm and wearing a harness and leash, you can place her in the child's arms, but keep the leash short and under control. It's safer if children sit on the ground to hold and play with a Chihuahua. Owning a toy breed means constant supervision and surveillance of what's going on around your tiny dog. Outside of their own fenced yard, Chihuahuas should always be kept under leash or arm control. Too much can happen to these little guys in the blink of an eye. What about illnesses or diseases? Here is my complete list of health problems in Chihuahuas. What colors do Chihuahuas come in? 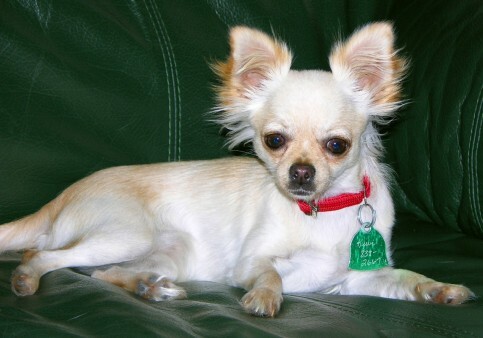 According to the Chihuahua Standard, Chihuahuas can be any color – solid, marked, or splashed. Solid includes fawn, cream, gold, red, white, black, chocolate, silver, and blue (dark grayish). Marked means a solid color combined with a few white and/or brownish markings on the face, chest and stomach, legs, and tail. Brownish markings can themselves be solid, or can be sabled (black-tipped hairs) or brindled (black streaks/stripes). Splashed means patches or spots of color on a white body, like a pinto pony. Blue is not a normal color in dogs, like black or brown or white. There isn't a blue gene. Instead, a blue Chihuahua has inherited a normal black gene... plus a dilution gene that washes the black into a grayish shade that dog fanciers call blue. Dark blue Chihuahua. Blue ranges from light silver to dark charcoal. Unfortunately, there is a skin problem associated with dilution genes. The symptoms are a gradual thinning or loss of the blue hair, plus nodules (bumps) on the skin, and repeated bacterial infections. If you have a blue Chihuahua or are thinking of getting one, read more about color dilution alopecia on my Chihuahua Health page. Merle is both striking and attractive: a swirled/patched/mottled pattern, usually gray-blue, black, tan, and white. Often one or both eyes is blue. You've probably seen this color in Australian Shepherds, Shelties, or Collies. Fairly recently, though, merle dogs have been showing up in a number of breeds (for example, Chihuahuas, Pomeranians, and Poodles) that historically didn't include merle dogs. The suspicion, probably justified, is that another breed with the merle gene was crossed with the breed that didn't have it, inserting the merle gene into the latter's gene pool. In the case of the Chihuahua, blue merle Dachshunds were probably crossed in. 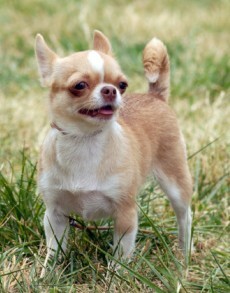 Which essentially means that merle Chihuahuas aren't truly purebred. But since genetic diversity is a good thing in living creatures, I don't view cross-breeding as an evil thing. 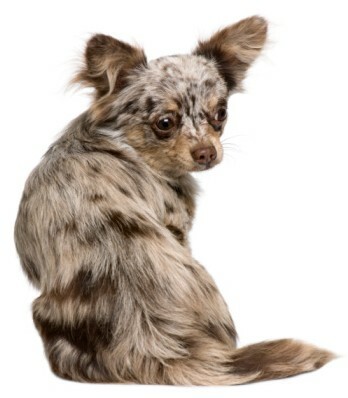 If there are a few Dachshund genes floating around in a merle Chihuahua, that wouldn't bother me. 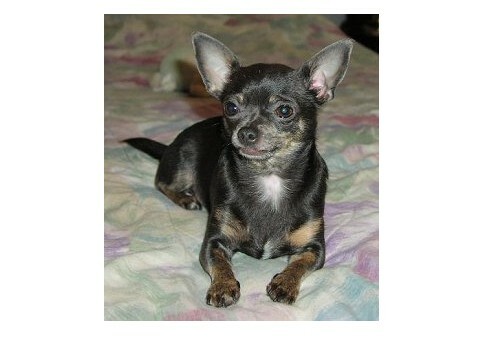 But what does bother me are the potential health problems of merle Chihuahuas. Just as dilution genes act on pigment by washing it into a lighter color, merle genes act on pigment by whitening it. This results in lovely swirls and patches. Unfortunately, that whitening effect is not limited to hair. The pigment inside a dog's ears and on their eyes – essential pigment that nerve endings require to conduct auditory and visual impulses – can also whiten. The nerve endings gradually atrophy, resulting in partial or total hearing loss, and/or partial vision loss. This is most likely to happen when a puppy inherits merle genes from BOTH parents. Thus, a merle should never be bred to another merle, as the risk to the pups is huge. Skeletal and cardiac deformities can also occur. Because of these risks, many countries have banned merle Chihuahuas from being shown at dog shows. Some countries have even banned them from being registered. 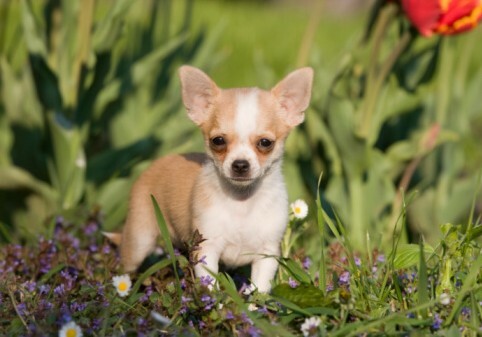 Here in the United States, the national Chihuahua Club and the American Kennel Club have chosen to accept merle Chihuahuas. So buyer beware. Don't buy a merle puppy from two merle parents. And don't let greedy breeders gouge you into paying an outrageous price for a color with potential health risks. 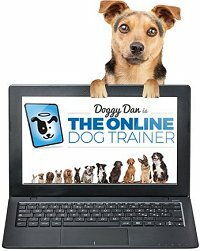 Or check out my training tips to teach your Chihuahua puppy to be well-behaved. Chihuahuas are very common in the United States. Close to 200 breeds are ranked in popularity by the AKC (where 1 is most popular) and Chihuahuas rank around the 30th position. But they're actually much more common than that, because a lot of Chihuahuas are registered with other organizations, or left unregistered. What I'm saying is that it's very easy to find a Chihuahua. But first, are you really, really sure you want one? Are you sure you can provide what this breed needs? Extra safety precautions – ongoing supervision and surveillance of what's going on around your Chihuahua, being careful where you step or sit, not allowing leaps from high places, keeping small objects off the floor, blocking all slats and gaps in fences and railings, etc. Next, consider whether you want a Smooth Coat or Long Coat, an applehead or deerhead, a cobby build or deer build. Or you can just hop onto Craigslist and buy the first Chihuahua puppy you see from someone who "just breeds pets" or "just had one litter." But should you? If a seller can't show you those certificates, the puppies are higher risk for health problems. You might choose to accept that risk. But then you need to be willing (and able) to pay a couple thousand bucks for future surgeries and lifelong meds if your Chihuahua ends up with inherited cataracts and bad knee joints. Adopting an adult Chihuahua or Chihuahua mix can be very rewarding – for both you and the dog. How do I adopt a Chihuahua? Chihuahuas (and Chihuahua crosses and mixes) are frequently available from Dog Rescue groups. Chihuahuas may be turned over to Rescue because of housebreaking problems, or barking, or general nastiness when unsocialized or treated like babies. 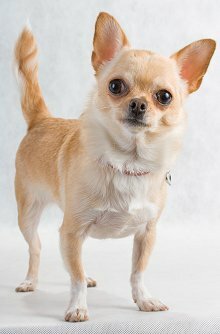 Other Chihuahuas are given up simply because of changed family circumstances, and these dogs may have no behavior problems at all. Chihuahuas can sometimes be found here, although shelter personnel can be overzealous in labeling every small dog with big eyes and ears as a "Chihuahua cross." Be aware that dogs can look like Chihuahuas without having any Chihuahua genes at all. What breeds are similar to Chihuahuas? 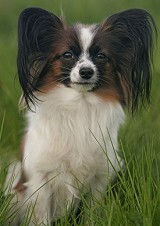 The Papillon is similar to a Chihuahua in appearance.... at least similar to a longhaired, tricolored Chihuahua with a slender, graceful build. But the Papillon's temperament is quite different, tending to be milder-mannered, quicker-moving, more inclined to play fetch, and loves racing on an agility course. Also easier to housebreak! If you want a tiny breed and have allergies, consider the Yorkshire Terrier. 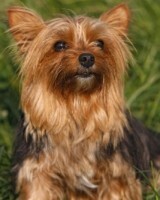 Yorkies are a nice blend of terrier and toy traits and you clip the coat short for easy maintenance. But very hard to housebreak! If you want a truly spunky little guy with a low-maintenance coat, and you don't mind some shedding, consider the Toy Fox Terrier. He's similar to a Yorkie in being a blend of toy and terrier traits, but coming down a bit more on the terrier side. 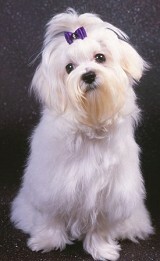 If your heart is set on a tiny dog and you're allergic, the light-shedding Maltese might fit the bill. Compared to Chihuahuas, Maltese have a softer, sweeter temperament, as their ancestry is not terrier, but spaniel. Hard to housebreak, though!